Our volunteers strive to provide the best possible environment for the foster dogs in their homes. Our foster dogs are treated like family pets. While the dogs are in foster care, we work on their housetraining, basic good manners, and "social skills." As a result, we find that our foster dogs move easily into their permanent homes, as they are well-adjusted to family life already. While in foster care, our dogs are exposed to cats, children, other dogs of various sizes and temperaments, and as many strangers as possible. 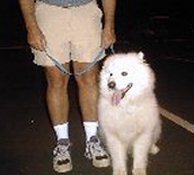 Dogs that show difficulty in getting along are carefully evaluated and every attempt made to retrain them. 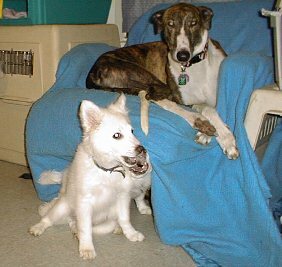 Many come to us with problems such as fence-climbing, "bad manners" such as jumping up, or housetraining difficulties. We work with the dogs to solve any behavioral problems before placing them into permanent homes. Good nutrition and exercise are important to our dogs' health. Foster dogs are carefully monitored to ensure that they are not over- or under-weight and that they are eating properly. We feed premium foods, and dogs with special dietary needs, such as vegetarian diets (for dogs with severe food allergies) or senior diets (for older dogs) get the proper food, based on our veterinarian's recommendation. These foods must be purchased, but a healthy dog is worth the extra expense. Exercise comes in the form of active play with other dogs in the foster home, walks, chasing the cats (well, we don't encourage that, but it happens! 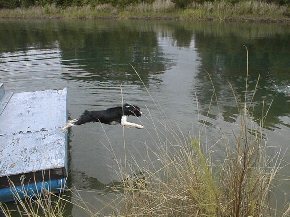 ), and a big favorite for many dogs, SWIMMING! Some of our foster dogs attend obedience school, where three of our volunteers are instructors. In addition to learning basic obedience commands, the dogs are given an opportunity to meet new people and other dogs. Many of our dogs have been placed into wonderful homes as a direct result of attending school! Crate-training is also an essential part of foster care-giving. We firmly believe that every dog should have his own crate, not to be "caged" in, but to give him a private place to relax. Our foster dogs are allowed as much freedom as they can responsibly handle, but all are crate-trained. Dogs that show mature behavior are allowed freedom in our homes when unattended. However, if they are immature and display destructive behavior or house-soiling, they are provided with a crate during unsupervised time. Crate-training is also essential because we are in an area that is prone to hurricanes! 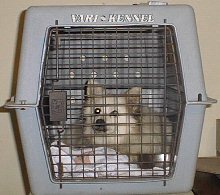 Our dogs must accept being crated, should we ever need to evacuate to a shelter with them. Excellent veterinary care for our foster dogs is extremely important. The doctors and staff at Cedar Animal Hospital give our rescued dogs extra-special care. Many of our dogs must go through heartworm treatment, and others require minor surgery or testing that requires overnight visits. Dr. Christiansen and Dr. Gill provide loving, competent care for our canine kids. When our foster dogs spend time at Cedar Animal Hospital, we can rest assured that they are in good hands. We are very fortunate to have veterinarians who believe in what we are doing and are very supportive of our work. Our goal is adopt out a dog that is physically and mentally sound. Every effort is made to ensure that our foster dogs are in the best health possible prior to placing them into a permanent home.